Birmingham is about 120 miles Northwest of London, a motorway drive of about two and a half hours. 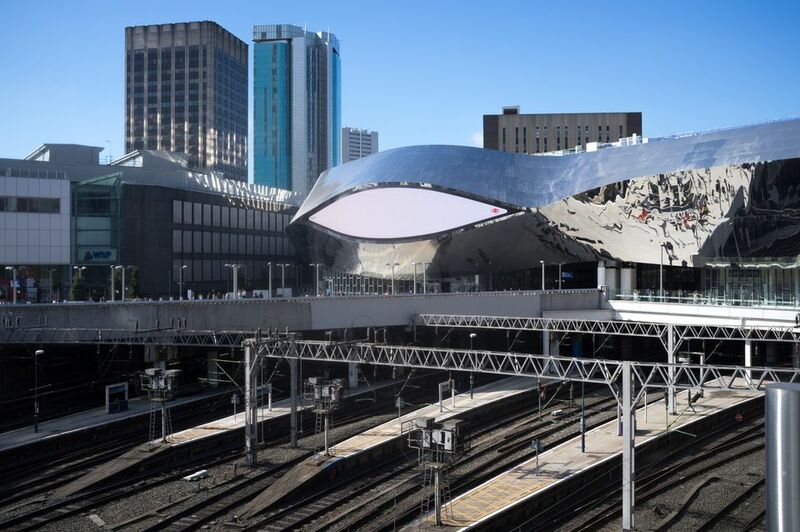 Take the train and you can cut an hour off the trip leaving you lots of extra time to discover what a surprising urban destination this Midlands city is. Birmingham New Street Station, rebuilt and opened to the public in September 2015, is a huge, bright destination where you can shop in some of Britain's top stores until 8 p.m. (the biggest John Lewis outside of London, for example) and dine until 11 p.m.
Redevelopment aside, the station, in the center of Birmingham, remains a major hub, connecting London and the Southeast to Wales, the West Midlands, and the Northwest. There are frequent trains to and from London Euston and London Marylebone stations. Virgin Trains operates the service from Euston into Birmingham New Street. Chiltern Railways runs a slightly slower, comparably priced service to nearby Birmingham Moor Street Station. There is a pedestrian tunnel between the two stations. Buy your tickets well in advance and book a specific train. A one-way, "Anytime" ticket bought on the day of travel for this trip will cost much more than a ticket booked a few weeks in advance. You can book online, directly with the rail companies running the service. The National Rail Enquiries website will guide you to the online ticket seller. Tickets can also be purchased through Rail Europe. Avoid traveling at peak travel times. For London to Birmingham, that would be between 8 a.m. and 9 a.m. If you can't decide which combination of times and tickets will save you the most, use the National Rail Enquiries Fare Finder, a feature that searches for the lowest fares. If you can be a bit flexible about your time of travel, that often helps when working with the fare finder. If you are heading for Birmingham for an exhibition at the NEC, use Birmingham International Station, instead of New Street. The fares are about the same. Buses from London to Birmingham take between 2 hours 40 minutes and 3 hours 15 minutes. There are hourly buses between Victoria Coach Station in London and Birmingham Central Coach Station. Book for a specific time and you can save quite a lot. An advance purchase, return ticket can save you a lot each way when booked online for a specific time. When you're ready to purchase your bus fare, visit National Express or, for extra cheap tickets, try Megabus. Birmingham is 119 miles northwest of London, via the M1 and M6 motorways. It takes at least 2 hours 30 minutes to drive when there is no traffic and fuel in the UK is expensive—probably about twice what you are used to in North America. If you are new to driving in the UK, think twice before hopping in a car to drive to Birmingham. The city's position at the hub of a number of important motorway routes, as well as the pattern of development of its downtown area in the 1960s and 1970s, make it a difficult place to drive—even for UK drivers who are used to driving on the left. Trains or buses are a better option for visitors and, once you arrive, the city's local transportation is excellent. If you do choose to drive, you can use the Automobile Association Route Planner to map a route with suggested stopovers and gasoline stations. For those looking to save a few bucks, check Daily Petrol (Gasoline) Prices to find the cheapest gas prices along your route.